The Linkskey LVS-002E is a 2-port Video Splitter with an enhanced video bandwidth of up to 350 MHz, supporting a resolution of up to 2048 x 1536 pixels. It allows two monitors to display the same video source from a single PC. The Linkskey LVS-004E is a 4-port Video Splitter with an enhanced video bandwidth of up to 350 MHz, supporting a resolution of up to 2048 x 1536 pixels. It allows four monitors to display the same video source from a single PC. Ideal for connecting one computer to two VGA monitors. Ideal for presentations; conferences and training purposes. For lower resolution monitor. 1 x HD15 (VGA) Male to 2 HD15 (VGA) Female. Shielded to prevent unwanted EMI/RFI interference. Fully molded connectors with 4/40 thumbscrews provide a quick and easy connection every time. Length: 8 inches. 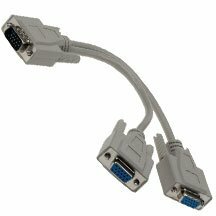 2-Way VGA Splitter 450MHz Max 2048x1536 Resolution. This product is a signal booster and duplicator which can take video input from a single source; broadcast and display it on two VGA monitors in a distance up to 180 feet (60M). It features a signal bandwidth of 450MHz. High resolution setting of 2048 x 1536 in 24 or 32-bit true color mode will also secure the high quality of the video graphic images to be displaying. It's ideal for an environment of education; meeting and commercial demonstration. 4-Way VGA Splitter 450MHz Max 2048x1536 Resolution. Takes PC video signal and displays it on 4 VGA monitors. This product is a signal booster and duplicator which can take video input from a single source; broadcast and display it on four VGA monitors in a distance up to 180 feet (60M). It features a signal bandwidth of 450MHz. High resolution setting of 2048 x 1536 in 24 or 32-bit true color mode will also secure the high quality of the video graphic images to be displaying. It's ideal for an environment of education; meeting and commercial demonstration. VGA splitters enables you to output the video from your computer to two monitors or displays. Splitter will allow for the same image to be shown on 2 or more displays. We have Cascadable Video splitters with Enh Video Bandwidth 350 Mhz, VGA male to female splitter cables, and other VGA splitters with different specification to cater to individual requirements. SF Cable constantly keeps up the efforts to offer you products at reasonable costs without compromising with the quality. Trusting only ISO 9001- 2000 certified manufacturers helps us maintain this flawless standard in the market. Customer satisfaction and good after sales service continues to be our first priority.